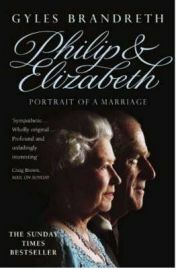 Philip & Elizabeth: Portrait of a Marriage by Gyles Brandreth looks at the nature of the relationship between Prince Philip and the Queen over the six decades of their marriage, and prior to that through the years they knew each other after they met when the Queen, then Princess Elizabeth, was only thirteen. Brandreth is quite open about his intentions in writing the book: he is reasonably well acquainted with Prince Philip (he would not say they are close friends) and wants to dispel some of the myths that he is a grumpy and rude man. Unlike the marriages of most of their children, the marriage of Prince Philip and Queen Elizabeth II has stayed the course. They were married in 1947, five years before the death of King George VI. They had four children, only one of whom has had a successful first marriage, and have resolutely done their duties for over sixty years. Yet the Prince often attracts criticism for his “gaffes”, and the Queen for her apparent lack of feeling. However, Brandreth asserts that the Prince is not as daft and out of touch as he seems, and that many of his remarks are misunderstood – he explains that the Prince is a lively man who is always keen to get conversations going and make people feel at ease. Similarly he tries to dispel the myth that the Queen has no feeling by explaining that she was brought up in an age and in a position where she was taught to keep her feelings to herself and not to display them in public. Philip & Elizabeth, while labelled as a “portrait of a marriage”, includes a lot of biographical material, rather obviously. It begins with some history of the family both are descended from, and covers their childhoods and adolescence. The book is not, however a straightforward biography: it covers many important events and the times which shaped the Queen and Prince’s characters, but it also skips a lot. There are no blow-by-blow accounts of royal tours here, and even the births of their children are not covered in detail. Right from the outset, it is clear that Brandreth’s account is going to be a sympathetic one. In fact, before you start reading it is quite obvious that it will be, if you know anything of Brandreth (former Tory MP and regular guest on various TV shows). He is biased towards the couple, and Philip in particular. Given his acquaintance with the Prince and his desire to show Philip’s true character, there is more of a focus on the Prince in the book. This is also necessitated in part by the fact that the Queen is very tight-lipped about her private life (as is the Prince, but his character is naturally more outgoing and is easier to know and understand). As part of Brandreth’s bias towards his subjects, he does tend to rubbish other biographies of them and the extended royal family which may take a more negative or sensational view. While I do like the royal family, I am not blind to their faults, but I must admit that the other works which Brandreth mentions do all seem to be a bit ridiculous or completely without factual basis. Perhaps some of the assertions in these other biographies are true, but none of them provide any evidence, and that is what Brandreth takes issue with. I’m inclined to agree with him on this point – accusations shouldn’t be flung around by biographers unless they can back them up. It is important to note however, that on the whole Brandreth is respectful towards his fellow royal biographers, even if he disagrees with what they have claimed. This is not an authorised book, although Brandreth claims he hopes it has “authority” – he shadowed the Queen and Prince Philip for a time in order to learn more about their day-to-day life. However, I could not say that this is a book with “authority” – it is certainly enjoyable, and may not be as disliked by the royal couple as many other royal biographies written about the family, but Brandreth’s style is far too chatty to have any gravity. He frequently refers to himself, his relationship with Prince Philip and his many royal and aristocratic acquaintances (he does acknowledge in one of the many footnotes that he is a name-dropper); for me a royal biographer should be detached from their subject. Then again, this is not a biography in the strictest sense of the word. Brandreth‘s style is very accessible, friendly and chatty, and could probably be described as populist – it is eminently readable, while many may find more authoritative works (such as William Shawcross’s official biography of the Queen Mother) as quite dry. Although Brandreth’s informal style is not entirely to my taste, it does have its benefits as he quotes many anecdotes from his personal experience of Prince Philip, and some of the Queen. While I have my doubts about the place of these anecdotes in a biography of royalty, they are without doubt fascinating and give us a better insight into their personalities. Their life is one of routine and endless handshakes, and while they would never complain about doing their duty, it must be wearing at times. Additionally, Prince Philip has a difficult position. Their marriage took place in a time when the man was very much head of the household, yet with a few short years of their marriage, his wife was Queen. He was not wholly trusted by the establishment and had to find his own role. He has dedicated his life to supporting the Queen, and to his many charities and patronages. While many readers may not be swayed by Brandreth’s sympathetic portrayal of the Prince, I fully agree with him that no one looking at the full list of patronages he has held which is included in the book could dispute the Prince’s commitment to the many causes he is involved in, and the good work which he has done through his life. Philip & Elizabeth was a departure for me from my usual, more authoritative historical reading, yet one that I enjoyed. I won’t be rushing to read Brandreth’s other royal work, Charles & Camilla: Portrait of a Love Affair (!!! ), and I felt that his style lacked gravitas, but it was nonetheless an enjoying and reasonably insightful read. No Comments on "Philip & Elizabeth: Portrait of a Marriage"